To make January that little less dreary, we can enjoy the fabulous tradition that is “Wassailing!”..
We have blogged about this in the past, it certainly adds some colour (and merriment) to a month where we are recovering from Christmas excesses. Here are some links to reviews that we favourited on Twitter and Facebook. A gentle portrait of Frank Naish, (86), possibly the world’s oldest cider maker, on his farm in Somerset, with helper Paul Chant. Collecting apples on a frosty morning in November 2010, Frank continues a life-long devotion to the artisan way of producing cider, which he did with his brother Harold until his death in 2005. Since then, Paul has worked with Frank, allowing him to continue his passion well into old age. As Frank says, it’s hard work and plenty of fresh air that keeps him going. On a winter’s evening in January, usually Old Christmas Eve (January 5), Twelfth night (January 6) or Old Twelfth night (January 17), about 200 townsfolk gather to play witness to a wassail ceremony, which resembles something out of a medieval Shakespearean play from what I’ve seen on the Internet. 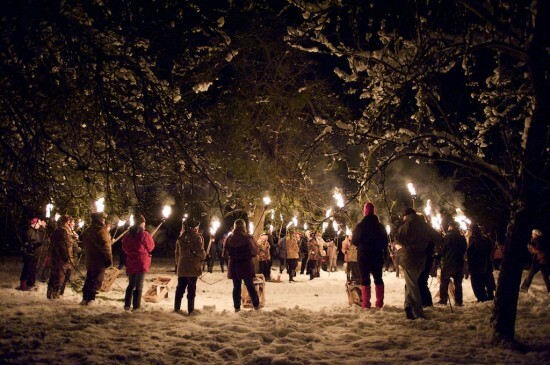 A wassail King and Queen lead a torch-held procession in song, from orchard to orchard. The wassail was important in the past when part of a labourer’s wage on a farm was paid in cider. Today, farmers who are motivated by superstition and tradition carry on the pagan ceremony. After much dancing and singing, noise making and merriment, the evening culminates in gunshots to scare the evil spirits away, and the wassailers head back to the local pub for dancing, cider, and entertainment. All will usually provide hot food and drink available and a well stocked cider bar. Here is handy song sheet to sing at your Wassail event. I got this from an award winning Morris Dance team at the Bath and West Show. I hope it brings you much success and bountiful crops of apples in the forthcoming season. Happy apples and happy cider drinkers. Perfect!